The following tutorial will guide you through setting up your FTP client properly for transferring files to your account. We will be using the open source FileZilla FTP ( http://filezilla-project.org ) client as an example, which we recommend as the best freely available FTP option. However, as a rule of thumb all FTP clients will have simliar settings for controlling the site profile and transfer settings. In order to connect to your account properly you will need to first create a profile for your site with the correct authentication settings. Step 5: Enter your UserID and password for the hosting account. You can retrieve these details from the cPanel Hosting Welcome email you received upon creating your account. You must be careful with these settings as they often default to “0” or Unlimited. This means your FTP client will attempt to open as many connections as possible to the server and you risk a temporary or permanent IP block. Our servers are protected behind a firewall which will block an IP when more than 6 connections are attempted within a certain period. Some users forget to setup their FTP clients properly, which can result in being blocked by the server. 1) Your Maximum “Simultaneous” or “Concurrent” transfers. 2) Your Maximum Uploads & Downloads. 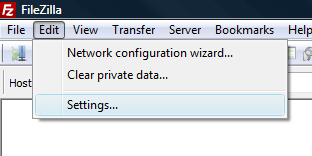 Step 2: Under FileZilla’s Settings Menu, Select the “Transfers” menu option. Here you will see the Global Settings for “Concurrent Transfers”. You must make sure your maximum simultaneous transfers is set to 2 or less. IMPORTANT: You must also make sure your limits for concurrent downloads & uploads are set to 1 or 2. This setting will overide the maximum simultaneous transfers setting – if set to “0” or unlimited, you will be blocked by the server for opening an unlimited number of connections to the server.